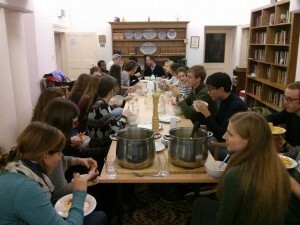 CathSoc Night is the main mid-week student gathering at the Chaplaincy. It takes each Wednesday after the 7:00pm Mass (so at about 7:30pm). We gather for a shared meal, talk (at about 8:00pm) and discussion, and then conclude with prayer (at about 9:00pm). It is not unheard of for there to be an adjournment to a nearby hostelry for further discussions thereafter. You are very welcome to come along for as little or as much of the evening as you like. On Wednesday 14 October we won’t have a formal talk, but a welcome from the CathSoc exec talking about what CathSoc and the Chaplaincy do and can do for you!